Summertime is zucchini time in gardens across the land. A prolific summer squash (as anyone who has ever discovered a 3-foot zucchini under the vines can tell you), this season’s bumper crop is just waiting to be cooked in amazing zucchini recipes. The delicate squash can be shredded and turned into a delicious Zucchini Bread or sliced and made the star of a Summer Squash Pizza. If you aren’t growing your own zucchini, a trip to the farmers’ market may be in order—and you’ll find recipes for the zucchini and other vegetables you pick up in our farmers' market fresh recipes collection. Summer: what a great time for fresh veggies. Get inspired and get cookin’. Squash is divided into two main categories: summer squash and winter squash. Harvested when immature, summer squash are characterized by thin, edible skins, soft seeds and a mild flavor. Their tender flesh has a high water content and cooks quickly. As their name suggests—and as vegetable gardeners well know—they are in peak season during summer months. The most popular variety of summer squash is zucchini. This versatile vegetable can be grilled, steamed, stir-fried, stuffed and baked to use in appetizers, salads, stir-fries, pasta dishes, side dishes, soups and quick breads. Other varieties of summer squash include pattypan and yellow straight-neck or crookneck squash. 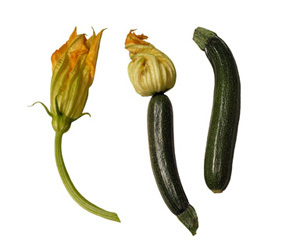 Select small to medium-size zucchini that are firm and feel heavy for their size. Their skins should look shiny and smooth with a bright, even green color and no blemishes. Refrigerate unwashed zucchini in a plastic bag for up to 5 days. Wash zucchini just before using. Trim off and discard both ends. Unless the skin is blemished, there is no need to peel zucchini. Cut into chunks or slices, shred or cut in half lengthwise and hollow out the centers for stuffing. Serve raw sliced zucchini with your favorite KRAFT Dip or Dressing. Toss sliced or diced zucchini into stir-fries, quiches, omelets, salads and soups. Hollow-out zucchini, stuff with seasoned cooked rice and bake until tender for a savory side dish. Simmer chopped zucchini in marinara sauce for a tasty addition to pasta dishes. Cut zucchini lengthwise into slices, brush with olive oil and grill until tender. Shred zucchini and use in muffins and quick breads for delicious, moist baked treats.